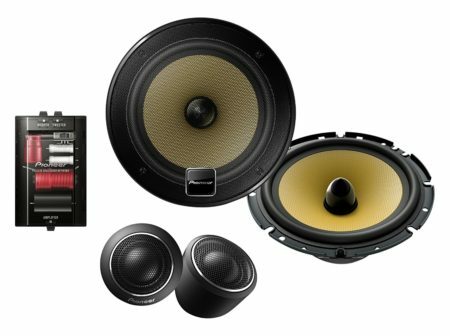 If you have a great speaker system setup at home, it can be hard having to listen to a sub-par speaker system in your car. Or maybe you spend a lot of time in your car commuting to and from work and you’ve just finally decided that you want a better audio experience. Whatever the reason may be, upgrading your car audio system can be a pivotal moment. Think about the first time you experienced watching your favorite movie in surround sound. You probably thought to yourself “how did I ever watch movies before this?”. Well, prepare to feel the same way about your car when you purchase the best component speakers out on the market – with our help of course. A lot of people are intimidated with upgrading the stereo system in their car. They’re either scared they’re going to break something or just don’t know where to start. All it takes is a (relatively cheap) purchase of some component speakers and you’re halfway there. Then just find someone who can install them for you (also usually pretty cheap) and voila! You’re good to go. If you have absolutely no idea about component speakers, we suggest maybe reading our buyer’s guide (at the end of the article) first. Otherwise, jump right into our list of the 19 best component speakers on the market today! We’re now switching over to our indivual reviews of all these component speakers above. The first set of component speakers that we’re featuring is a very reputable name when it comes to audio systems – JBL. They product not only component speakers but a wide variety of portable and home audio solutions. And they do not disappointed with the GTO609C. These speakers give you smooth, clear highs that won’t fatigue as well as a powerful bass experience. They also feature carbon-injected Plus One cones that are much larger than a lot of others in their class. This means that they’ll be able to move more air than other speakers thus giving you a lot more bass. JBL also features a dual-level tweeter volume adjustment so you can truly personalize the sound to your exact liking. They also do not use much electricity so they’ll make the most out of every watt your car stereo can deliver. These are true high-fidelity speakers that will impress the audiophiles out there as well deliver an impressive first experience if these are your first set of component speakers. These speakers are extremely easy to install as well and you can either flush-mount or surface-mount your component tweeters. Whichever you decide to do, you’ll still get an impeccable sound that’ll truly change your experience in the car. All in all, the JBL GTO609C are a good start to our list and are truly versatile speakers. You can customize the sound you’re getting but even if you don’t know exactly what you’re doing, these are great to learn on and will still sound great straight out of the box. MB Quart is another pretty well-known brand when it comes to component speakers, although not quite as well known as JBL. 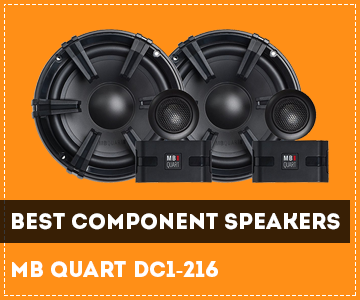 Either way, with the MB Quart DC1-216 they’ve managed to deliver an amazing option for those who might be on a budget or for those who just don’t want to spend a fortune on setting up a decent audio system in their car. Don’t let the price fool you – these speakers may only cost a little over $50, but you would’ve thought they cost $200. The bass speakers feature deep drawn steel case baskets to give you powerful, full, rich bass that will resonate throughout your entire car. They also have aluminum dome tweeters that distribute the sound evenly and give you a nice crisp sound in both the mids and the highs. While the first set from JBL came with just two speakers and one tweeter, these ones from MB Quart actually come with two tweeters. So if you listen to a lot of music with complicated sound or with a lot of different components to it (jazz, EDM, etc) then you’ll be able to clearly and easily hear every single note from every single instrument. 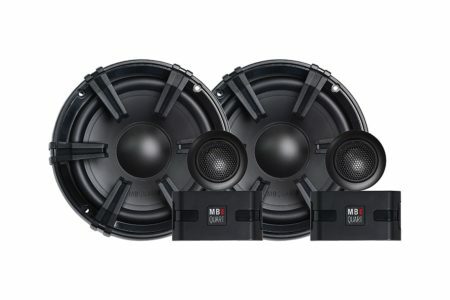 If you’re looking for a reasonably priced set of component speakers where you don’t have to compromise completely on the sound, then go with these from MB Quart. They easily compete with speakers in the $100 to $200 range. Overall, a pretty solid option from MB Quart and at a good price as well. Up next is Infinity with their Primus speakers. This comes with two speakers and also includes two tweeters like the previous ones from MB Quart. The speakers are pretty powerful and are 160 watts each for a total of 320 watts. Thse component speakers also include Starfish mounting brackets so you can easily install both of the tweeters. Of course, since you have two tweeters, you’re going to have crystal clear highs and very supportive mids. A great thing about these is that if you don’t feel like purchasing an additional external amp, you can just hook these up to your factory receiver that came with your car and these will still sound amazing. These speakers create a truly spacious sound and you can pick up on the smallest of details. Like we mentioned, with two tweeters, anything that has a lot of detail will sound particularly crisp. Think jazz, orchestral, electronic music, or even broadway music. Overall, these are another good budget option that will sound a lot better than most stock speakers in the car that you already have. They create a bright, spacious sound at an amazing. These are perfect if you’ve never purchased a pair of component speakers in your life or if you’re an audiophile looking to upgrade your stock speakers. One thing to note is that these are a bit more difficult to install than some others on our list so if these are your first, consider getting them professionally installed. Other than that, not much to complain about with the Infinity Primus speakers. Next on our list is a set of speakers (two speakers, two tweeters) that are decently priced but are of premium quality. These are 6.5 inches so will fit any standard existing speaker setup. The tweeters are 1 inch so they’re fairly discreet but they also come with swivel mounts. We love swivel mounts because you’re able to direct the sound exactly where you want it to go when you want it. One thing to note – the speaker grilles are indeed sold separately. These Alpine SPS-610C speakers easily handle extremely high volumes without any distortion whatsoever. Construction on these speakers are perfect and are honestly some of the best 6.5 speakers for the money. Where these speakers really shine is in the highs and mids. They’re not really meant to be used as a subwoofer so just be careful how much bass you put through them. 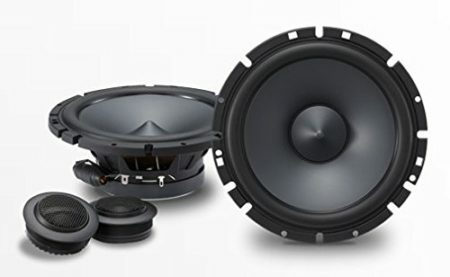 These car speakers definitely give you a solid foundation for bass but if you’re looking for something truly impactful, you might want to consider getting an additional subwoofer. All in all, these are a decent mid-range set of component speakers. Are they the fanciest speaker on the market? No. Are they better than a lot of other sets out there – especially for their class? Absolutely. If you don’t quite have the money yet to make that big leap of an upgrade that you’ve been wanting to do but still want something that sounds great in the mean time, then consider the Alpine SPS-610C. Infinity has managed to make it onto our list of the best component speakers again and we’re not even halfway through! To be fair, Infinity produces truly high-quality speakers and they’re able to do it at a price that’s accessible to everyone. These ones, in particular, produce a rich, full sound that not only focuses on the highs and mids but also produces a solid bass that makes it so you don’t even need a subwoofer! Seriously. Infinity also includes a bunch of different options for mounting the tweeters. Note, however, that they will probably require at least some sort of modifications if you want to put them in the factory location. While these speakers sound great without hooking them up to an amp, they will sound so much better once you do. So if you know how to, we suggest you do it and if you don’t – either find a friend or get them professionally installed ASAP. Another thing to note about these is that they do take a little bit of time to ‘break in’ if you will. It’ll probably take a few hours of listening but once they do, they’ll sound great no matter what song you put on. These are perfect all-around speakers. Some of the others so far have produced astonishing highs and mids but have been lacking a little bit on the bass. These ones, however, do not disappoint in any department and we confidently recommend the Infinity Reference 6500CX. If you’re looking for a pair of truly budget speakers that you can pick up without any hassle whatsoever – then you’re looking for the Pyle PLG6C. These mid-size speakers pump out 400 watts of power in the standard 6.5-inch size. The yellow injection cone provides you with great rigidity and also resistance to harsh weather conditions. The speakers themselves are housed in electroplated steel basket giving you one of the fullest sounds on the market. They also are equipped with a 40-ounce market. Not bad for speakers that literally only cost a little under $30. The Pyle PLG6C also give you a rich and accurate sound through their passive crossover networks. This is included with the speaker and works to separate the signal from the head unit between the mid-bass and tweeter speakers. The tweeter speakers are also some of the smallest on the market at only .5 inches so you can easily install these wherever is most convenient for you in your car. Pyle also includes Grills Wire Installation hardware to make installation as easy as possible. Still probably not quite easy enough if you’ve never actually installed component speakers before, but if you have some sort of knowledge you should be able to do it no problem. It does include a wiring template diagram as well as a wiring kit so if you’re able to follow that, then you should be up and running in no time. One final thing about Pyle that makes these speakers appealing is that they have a whole range of extras to buy if you want to down the line that will go perfectly with the speakers. This includes LED and neon lighting systems as well as car security systems. 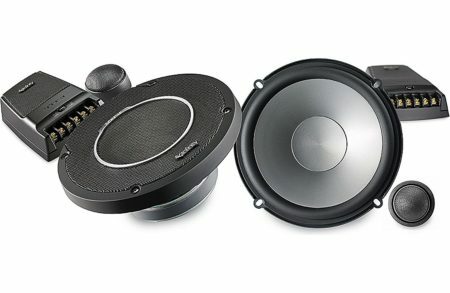 So if you’re looking for component speakers that could potentially fit into a larger ecosystem down the line, you should consider these as well. 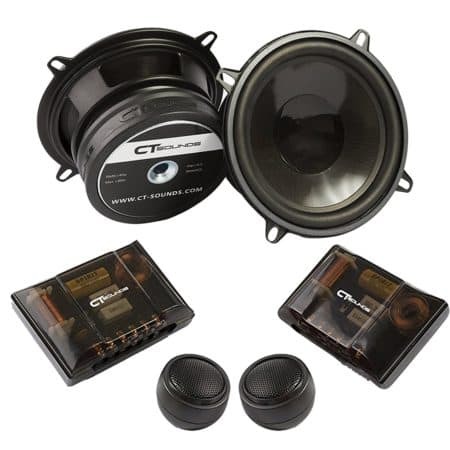 Up next is a set of component speakers from CT Sounds. Note, however, that while all the previous speakers on our list have been 6.5 inches – these ones are actually 5.25 inches. So these aren’t a standard size but if you need something a bit smaller, then these are perfect for you. These are great as well because they actually do come in both sizes – 5.25 and also 6.5. Most component speakers come in only 6.5 inches. We wanted to include these because of course, everyone has different needs and while 6.5-inch speakers work for most people, they don’t necessarily work for everyone. They provide a crossover network and a surprisingly full sound for only being 5.25 inches. You barely will be able to notice the downgrade in size with these speakers from CT Sounds. The tweeters are also the perfect size at 19mm so you can discreetly and easily put them wherever is best for your car. You can truly play just about any genre of music as loud as you want, with virtually no distortion and with great tonal accuracy. And for the price, $45, we’re genuinely shocked at how well they sound. All in all, these sound great without being hooked up to amps but once you do, the sound quality will go through the roof. If you’re looking for a set of speakers at a reasonable price that will give you little to no distortion with every genre of music, not matter how loud you play it – then we highly suggest going with the CT Sound Strato 5.25 inches (or 6.5 if you need them). Pioneer is another recognizable, trusted name when it comes to not only audio in general but also specifically component speakers. These are two-way component speakers with separately mounted .9” tweeters sitting inside of a 1.625” cutout – and two of them are included. Just note right off the bat however that these speakers are indeed 6.75 inches and not 6.5 inches. These Pioneer speakers do an amazing job at reproducing the sound exactly as it was when it was first created, including the ambiance. Pioneer touts and ‘open and smooth sound’ and they really stand behind that. Open meaning there’s open staging and there are sound characteristics that enhance the widening effect that will extend much farther beyond the space between the speakers. And it’ll sound smooth via the smooth transitions between the mid-bass and tweeter. There’s no sound loss caused by crossover frequency dips. While component speakers, in general, are not really meant to provide a powerful bass experience, some are still able to provide a pretty decent one. However, this isn’t the case with the Pioneer TS-D1730C. If you’re looking to really pump some bass through a set of speakers, you’ll want to purchase an additional subwoofer. This is a decent pair of component speakers from a leader in the audio industry that 100% will not disappoint. These are going to be miles better than the stock speakers in your car and they’re under $100. Not bad for a pair of name brand speakers that deliver some truly spectacular sound. We loved the Pioneer speakers so much we decided to include another set of their component speakers! These ones are a little bit cheaper than the previous ones but still provide a pretty decent sound. These are great for whatever needs you have and while they’re the 6.5-inch model, they are also compatible with 6.75 inches. You can get 350W out of each speaker with 60W nominal. One thing that’s unique about these is that the tweeter actually features a soft-dome design. Because of that, they deliver a much-improved range of mid to high frequencies and produce optimized sound at higher volumes. 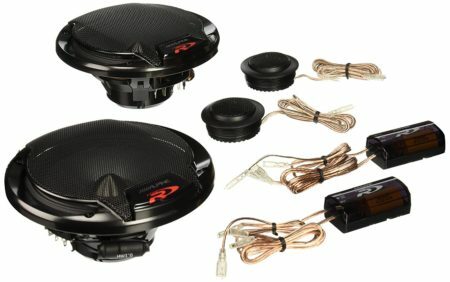 These are the perfect set of component speakers if you’ve never installed or modified any of the speakers in your car before. They are super easy to install and even if you’ve never done it before, you can easily do so by following the diagram. 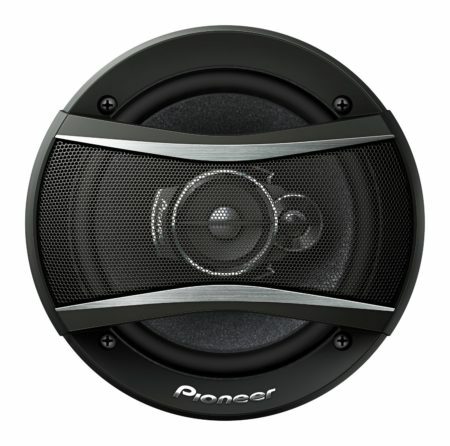 The previous Pioneer speakers we just reviewed were not necessarily the best at providing the best bass. These, however, are a completely different story. While they technically may be cheaper, they give you a much more well-rounded listening experience than the last. All in all these speakers provide a very full, rich listening experience. You can crank these babies up pretty loud and you won’t experience any harsh sounds or distortion whatsoever. The mids and highs are crystal clear but Pioneer also manages to deliver a pretty decent bass experience through a pair of component speakers. We are very pleased with these and give them a glowing recommendation. We think you’ll be very happy with the Pioneer TS-A1606C. 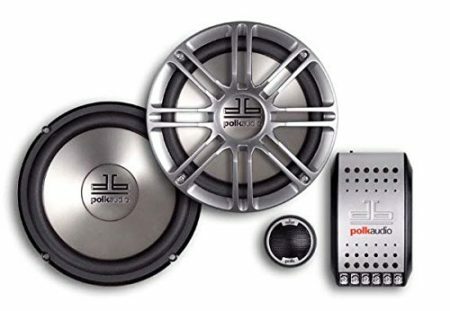 Polk Audio is next up on our list to deliver a set of component speakers that are going to exceed your expectations, especially for the price point. We admit that these are definitely a little more expensive than a lot of other component speakers on our list, but in the grand scheme of component speakers, they are very reasonably priced. Of course, now you’re wondering about the price – they’re only a little over $100. Before you completely dismiss them, however, hear us out! These speakers come with adapter rings which make it super easy to fit these into any car. Also while these are 6.5 inches, they can be fitted for either a 6.5 inch or a 6.75-inch application. They also feature two-way Butterworth outboard crossover with vented housing and electronic tweeter protection circuit. There is also a pair of tweeters included with this set, and they are some of the best tweeters we’ve seen on this list so far. It sets in a 25 mm liquid-cooled silk/polymer composite dome equipped with neodymium magnet that will give you some of the most detailed highs you’ve ever heard. Another thing that explains why the price is so high is you actually get a pair of subwoofers in addition to a pair of crossovers and a pair of tweeters. No other speaker sets on our list so far have included a pair of woofers. Also if you’ve never installed component speakers before, Amazon actually offers installation! It’s backed by Amazon’s happiness guarantee. They actually source somebody local so you still get local expertise, but with a satisfaction guarantee backed by Amazon. Definitely a bit expensive – but we think it’s worth it just for the fact that you get a pair of subwoofers with these! If you’ve never tried Polk Audio, we highly suggest giving the DB6501 a shot. You won’t be disappointed. Alpine makes another appearance on our list with a set of component speakers that are admittedly a bit more high-end. These are easily some of the best 6.5 component speakers under $200. Where these Alpine speakers really shine is in the clarity of their highs. Everything else is pretty good but you will be shocked at how clear and crisp the highs sounds in every genre of music you listen to. The mid-bass also sounds pretty good but the highs are the real star of the show in this case. One thing to note about getting the most you can out of the highs is to make sure that you have the appropriate wattage coming from your amp. You’ll probably want at least 100 watts to really get the most out of your music but even without it, you’ll still hear a very noticeable upgrade. These will also need to be broken in a little bit, like a lot of higher end speakers out there. The recommended break-in time is around 10 hours which actually isn’t that long for speakers in this class. Overall if you listen to music with a lot of instruments or with a lot of vocals, then these are the speakers for you. It’ll be like listening to your favorite song for the first time and you will truly hear parts of the song that you had no idea even existed before. These are definitely one of the contenders for the best component speakers of 2018 and we cannot recommend them enough. Kenwood is known for producing speakers for those of us on a budget who still have ears that can work. AKA, they make speakers at a good price and that still sound amazing. They really stay true to that with the Kenwood Kfc-P709Ps. They feature a 63Hz – 24kHz frequency response with a 280W peak input power. The tweeters are 1” and come with a swivel dome bracket for installation. As far as the crossover speakers, they have an injected polypropylene cone that has a diamond array pattern. This helps to direct the sound and make it sound fuller than you could ever imagine. These speakers easily beat out any sort of ‘premium’ speakers that are the stock speakers that came with your car. Woofers are indeed included with this set which is almost unheard of at this price, and they’re not bad. They’re probably one of the best pairs that you can get at this price tag and complemented by the amazing highs and mids you’re getting with the crossovers and tweeters – you get an extremely full, rich, encompassing sound. We really don’t have anything negative to say about the Kenwood Kfc-P709Ps. 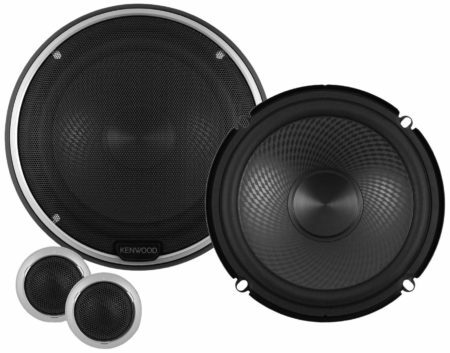 This is a solid set of component speakers from Kenwood and they deliver them at an even better price. You’re also able to get installation backed by Amazon with these if you so desire. We wouldn’t necessarily recommend trying to install these yourself if you’ve never done it, but if you have some experience you shouldn’t have too much trouble figuring it out. All in all, an impressive set of component speakers from Kenwood that we highly recommend. 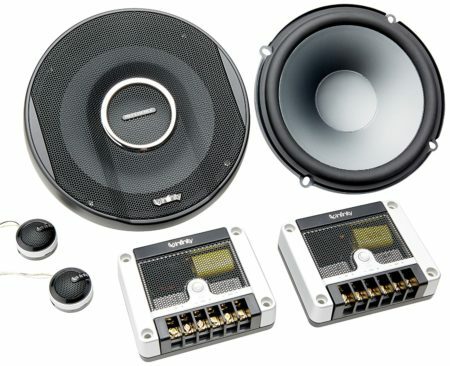 The next component speaker system that we have coming up next comes from Hertz with the Hertz DSK 165.3. They offer a truly amazing value. They’re priced a little over $100 but they honestly sound like they could’ve cost you $300. 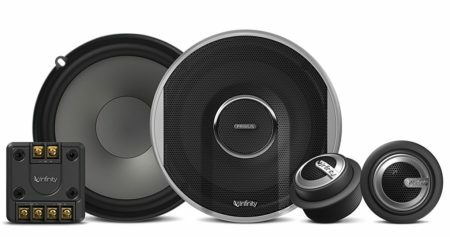 If you’ve never considered purchasing a set of component speakers from Hertz or have always overlooked them, you should take a minute to reconsider. They have peak handling of 160W on each side and 4 ohms of impedance which really isn’t too bad given their price range. They also feature a frequency response of 50Hz – 23kHz. If you have a good amp, they’ll give you a pretty decent bass response with crystal clear mids and highs. As we’ve mentioned before, don’t go too crazy with trying to pump your bass through here as they aren’t truly subwoofers. But with that being said, they’ll give you pretty decent sound overall. The mids are warm, brilliant, and extremely clear and you honestly won’t need that crazy of a bass. 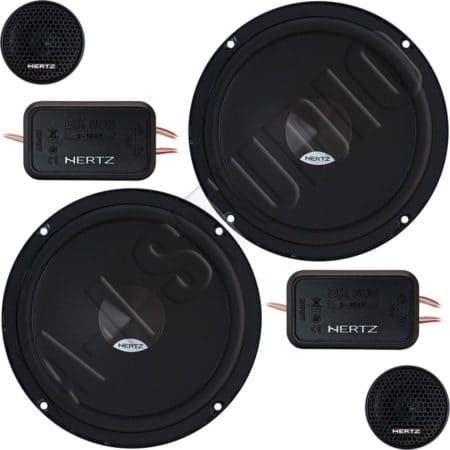 Hertz delivers a quality set of component speakers. We don’t read much about Hertz when it comes to component speakers but strongly feel that should change. These speakers easily compete with not only speakers in their class but also speakers that cost double their price. The highs aren’t harsh at all and you can crank these pretty loud. One downside is that they are a bit difficult to install and don’t include very clear instructions. If you’re going to get these professionally installed then it shouldn’t matter but just something to be aware of. Next on our list is another set of component speakers from a company that you might have never considered before – Rockford. These component speakers come in at a reasonable price and boy do they deliver. They employ Vertical Attach Surround Technique so they’re easy to install and the crossover component is actually built in. AKA there’s no separate crossover box that you’ll have to deal with. That alone can be a life saver, especially if you’re going to be installing these yourself. These are component speakers where you’re really going to want to take the recommended specifications into consideration. You won’t get optimal performance with just any amp with these guys so you’ll want to make sure you have a decent one. Not only will you be able to get crystal clear sound but you’ll be able to get it at volumes that you didn’t know could produce such clear sound. With a lot of speakers in this price range you’ll get a harsher sound the louder you go, but not with the Rockford Fosgate P1675. All in all, this is a great set of component speakers. The sound is smooth, encompassing, warm, and very full. This is an inexpensive way to upgrade your stock speakers. They’re also the perfect set if you’ve never dealt with component speakers before. This is the perfect way to get your feet wet and see what the world of component speakers is all about. 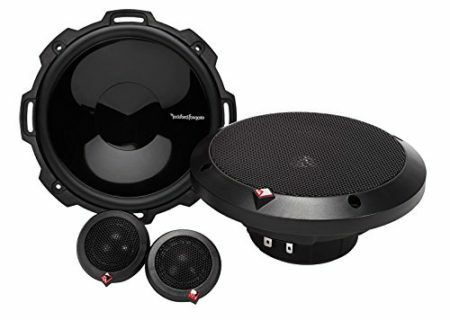 The Rockford Fosgate P1675 component speaker set comes highly recommended from us and we think that once you try them, you’ll agree. 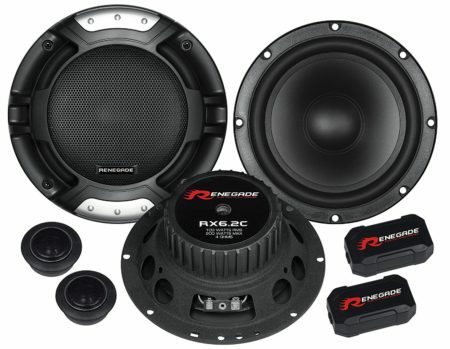 The next slot is taken by a pair of speakers from Renegade with their Renegade RX6.2C component speaker system. The last few sets we’ve reviewed have all been at a bit higher of a price tag but these come back down and will only set you back a little over $30. But of course, you don’t want to buy something just because they’re cheap. They’re a great price but do they still deliver a quality sound for their price point and also – can they compete with more expensive component speaker systems say in the $100-$200 range? In short, yes. These are 6.5” speakers with 100 watts of power and an electrical impedance of 4 ohms. These speakers provide really great value and can handle a lot of power. They’re also able to deliver a pretty decent sounding bass but the key to getting the best sound out of the bass is pairing it with a good amp. If you don’t, the bass will be essentially non-existent. So to really get the most out of these babies, make sure you pair them with something that will allow them to really shine. The tweeters that come with this set are also very nondescript and you’re able to easily put them wherever you wish. Overall this is another good budget option that still delivers high quality. With all the different component speaker sets out on the market, companies have been forced to really compete with both quality and price. It’s not really necessary anymore to spend hundreds of dollars to buy a ‘high-end’ set of component speakers. The improvement in quality is marginal compared to the price. You won’t be disappointed with the Renegade RX6.2C. 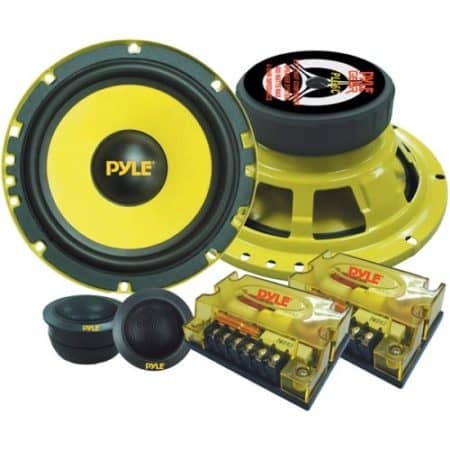 Coming your way next is another set of component speakers from Pyle. These are super heavy duty speakers but also probably the cheapest on our list! There is a bit of a catch, however. Take note that this includes only two 6.5” component speakers and no tweeters are included. If you already have a tweeter that you’re happy with, then great! Perhaps you just blew out one or both of your component speakers and need something cheap in the meantime, consider the Pyle Dual 5”. These are made from marine-grade, waterproof material. Seriously. These things can really withstand a beating. They have dual cone full range stereo sound reproduction via a polypropylene cone surrounded by cloth. These are perfect if you do a lot of off-roading or mudding but still, want to be able to enjoy high-quality music. It, of course, includes both the speaker wire and mounting hardware. Admittedly these aren’t the best component speakers in the world. But what they are is durable. If you’re looking to install component speakers somewhere that’s subject to a lot of unpredictable weather e.g. an RV or perhaps a boat then these are perfect for the job. They’re the perfect balance between quality and durability. If, however, you’re just looking for a pair of component speakers for your car you wouldn’t necessarily want these ones. But hey, if you need something cheap to throw in while you look for the next perfect pair, we aren’t going to stop you. For the price, you can’t really go wrong either way. Oh, we also forgot to mention – you can get these speakers in either a 100-watt, 120-watt, or 150-watt version and they also come in black or white. White is the perfect option if you’re going to be installing these on a boat. 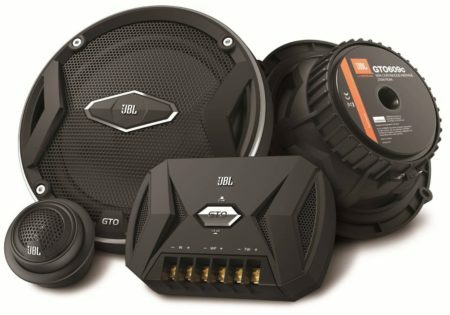 So overall, these are some good cheap car speakers. Next is another set of component speakers from Infinity – the Infinity Reference 6030cs. 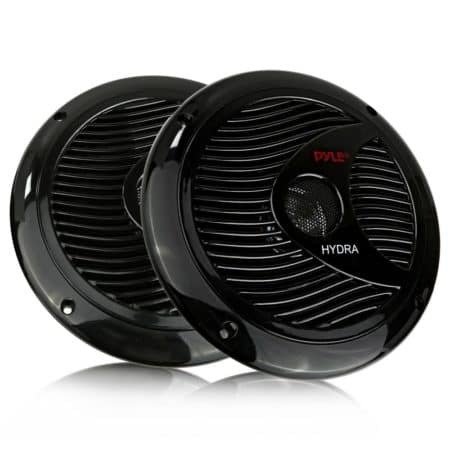 These are 6.5-inch two-way component speakers with peak power handling of 270 watts and also 2-ohm impedance. It also comes with two tweeters that have edge-driven textile dome that increases their ultimate power leading to reduced distortion at the highest of output levels. They also come with a one year warranty which isn’t super common with component speakers as people usually make a lot of their own personal adjustments. These speakers actually provide a pretty decent bass sound. It is optimized for cone-edge suspension and easily absorbs distortions that may travel up the cone-end which really strengthens the low-end. All necessary mounting hardware is indeed included in the box and installing this yourself actually isn’t all that confusing. If the whole process seems daunting to you, however, Amazon does offer professional local installation for only $45. And the guarantee is backed by Amazon – really not a bad price. All in all, another solid option from Infinity. They’re only 89 bucks, produce a decent sound, are easy to mount, and also provide you with pretty solid bass. Not to mention they’re pretty sleek looking so they’ll instantly improve the look of any car. We really love the Infinity Reference 6030cs and think you will too. If you’re looking for a set of component speakers that will also give you decent bass, then these are your speakers. Before wrapping up our list, and we are in fact getting close to the end, we wanted to include at least one more 5.25-inch option for those who don’t need the standard 6.5 inches. There are seemingly infinite choices if all you need is the standard 6.5 but not anything else. Anyway, the Alpine Spr-50c component speakers are strong speakers that provide a full and rich sound. They’re a bit pricier than some of the others on our list but we think that they fully warrant that price. They have a peak of 600 watts per set with a frequency response of 70 Hz – 29 kHz and also a sensitivity of 87 dB. These Alpine speakers do an amazing job at presenting the music exactly as it was recorded without distorting anything. This will become apparent from the very first time you listen to these. Notes and vocals will jump straight out at you that you’ve never heard before. As we said, they are a bit pricier compared to some others on our list (these will run you almost $150) but they compete with any major brand out there, including Bose. If you’re looking to truly upgrade your sound system in your car, then it’s time to get serious and give the Alpine Spr-50c a try. These are powerful speakers that provide little to no distortion, even when you’re blasting your favorite song. Simply put, these just sound awesome and they will make any road trip you take in the future that much more enjoyable. 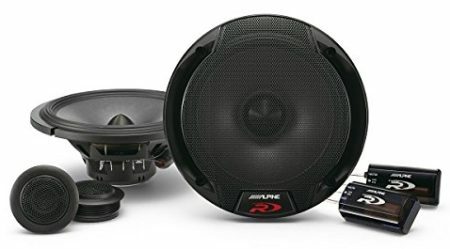 You absolutely cannot go wrong with the Alpine Spr-50c component speaker set. 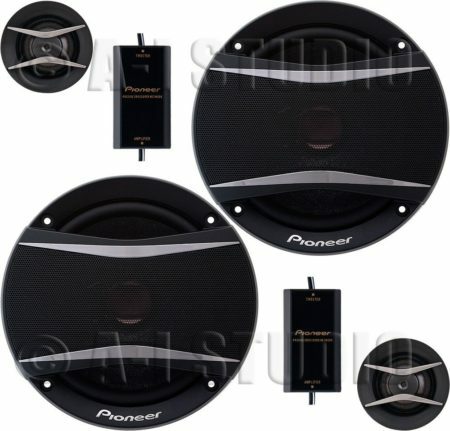 And for the last set of component speakers on our list, we had to include another set from Pioneer! Their quality is just unparalleled, especially for the price. These, of course, are at a banging price. Not too bad. They also offer tons of variations on this model straight out of the box. They have five different speaker sizes to choose from, three different speaker system classes, and nine different maximum output powers to choose from varying from 200 watts all the way up to 650 watts. Of course, the price will vary as you play with those settings but still – not a bad starting price. The specific one we will be discussing is the 6.5 inch, 3-way, 320-watt system. It features a multi-later mica matrix cone design that allows the sound to be reproduced perfectly. It reproduces the ambiance in which the sound originated. This includes stage size, the musician’s movement, aural reflection, and other distinctive details. They know how to perfectly engineer sound so that the highs are accurate, the mids are perfectly full, and the lows give you just the bass that you need. We’re absolutely in love with the last pair of component speakers on our list and these are a definite contender for the best component speakers of 2017. Even if you’ve bought a set of component speakers before, there’s always something else that you can learn. Every time you upgrade, you learn about something that you should’ve bought or done differently. Or if this is going to be the very first set of component speakers you’ve ever bought, then it can be a bit overwhelming and confusing. To help make your decision a little bit easier, we’ve decided to include a buyer’s guide so you can easily see all the important factors that go into purchasing your very first set of component speakers. So whether this is your first or fifth set, check out our buyer’s guide below to make sure you don’t miss anything before you buy. Also make sure to check out the video below if you’re unsure what the difference between component and coaxial speakers are. This refers to the amount of power that your speaker is actually able to handle. This is going to partially depend on how powerful your external amps are. If your external power system doesn’t go that high, then you won’t necessarily need speakers that can handle a lot of power. If, however, your external power system puts out a lot of power – you’re going to want to make sure that you buy a set of component speakers that can handle what’s being put out. This may not seem like a big deal but it actually has a big effect on what type of sound the woofer will produce. You want to make sure the material is stiff but also lightweight. Polypropylene is the default for a lot of manufacturers and this will serve the purpose most of the time. Polypropylene mixed with a material like mica is even better and will give you an even more accurate bass response. Further yet – fabrics coated with metals like aluminum or titanium are still lightweight while providing an even better response. And of course, the materials must be able to withstand heat, cold, and moisture as your car is subject to a lot of varying temperatures. Yes, the material is going to vary between what is being used on your woofer and what is being used on your tweeter. They each need a certain type of material to be able to perform optimally. On your tweeter, you’re going to want a softer type of material like perhaps some sort of textile blend, or silk even. It makes the sound a lot more mellow while still refined. If however, you like the bright sort of sharp sound in your highs, then you can consider going with a harder material like you would use in your woofer. However, a softer material is generally recommended. These are used to separate the frequencies that are being sent to the woofer and the tweeter. Since each is meant to produce a certain frequency, this helps to ensure that both the tweeter and the woofer aren’t wasting energy trying to produce sounds that they shouldn’t be producing. As a result, you’ll get a much cleaner sound that’s efficient and much more accurate. Component speakers generally come with external crossovers, although there are a couple on our list that has crossovers that are not external. External ones work better but are generally more complicated to set up. There are so so so so many different sets of component speakers. They all vary so wildly as well so of course whichever one you end up choosing is going to greatly depend on your exact needs, what will be compatible with your exact car, and your personal preference as to what you prefer. The sound from a Pioneer set is completely different than the sound from a JBL set. However, we still feel like there was one set of component speakers that took the title of the best component speakers 2018. Curious as to which one took the cake? We are going to have to go with the underdog the MB Quart DC1-216! These had a lot of stiff competition from a lot of other big brands on our list but they stood out. These were the second ones we reviewed if you forgot about them already. They are at an amazing price and deliver crisp mids, clear highs, and also a pretty hefty bass for having no subwoofer. They actually come with two tweeters and do an amazing job at reproducing music that has a lot of different components. All in all – we think these MB Quart component speakers definitely give you the most bang for your buck. Thanks for reading! We hope we gave you a lot of different options for component speakers and made your decision even a little bit easier. You should now be well on your way to high-quality sound in your car. Happy listening! Like what you see? Then please rate this post.